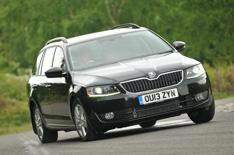 2013 Skoda Octavia Estate review | What Car? The Skoda Octavia Estate has always been an affordable yet spacious family car, but this all-new version takes practicality to an even higher level. Versatility, passenger space and the engine range have all been enhanced. True, prices have risen by around 1000 compared with the outgoing model, but you get more equipment, so the Octavia still looks great value for money. At launch, buyers will be able to choose between turbocharged 1.2 and 1.4 petrol engines and 1.6 and 2.0 diesels, plus Skoda will offer four-wheel-drive versions of the diesels. A Greenline diesel is due to follow bringing average economy of 83mpg and CO2 emissions of 87g/km and there'll also be a hot vRS model. What's the 2013 Skoda Octavia Estate like inside? With the rear seats in place, the boot is just five litres bigger than the previous car's at 610 litres. However, it's a very practical space with plenty of clever touches. On SE versions and above, the rear seats can be folded using levers in the boot, and the optional variable boot floor (150 on S and SE versions and standard with Elegance trim), flattens out the considerable step in the floor of the loadbay. The variable floor can be set so there is no entry lip, too, or dropped to maximise capacity. It's attached to a rotating bezel by the rear seats, meaning it can be raised or lowered with one hand. Maximum load capacity with the rear seats down is 1740 litres that's more space than you get in estate versions of the Ford Mondeo, Mazda 6 or VW Passat. Passenger space is just as generous, while the front seats are supportive and the large rear windows help to provide good rear visibility. Skoda has improved interior quality, too, using classy materials on the dashboard, and fitting a touch-screen infotainment system that looks smart and is easy to use. Three trims are available S, SE and Elegance and even the cheapest of these gives you air-conditioning, alloy wheels, seven airbags, stability control, Bluetooth, DAB radio and a USB socket. SE trim adds dual-zone climate control, four electric windows and a fatigue sensor, while Elegance also brings sat-nav, cruise control, part-leather and Alcantara upholstery, and automatic lights and wipers. What's the 2013 Skoda Octavia Estate like to drive? The diesel engines will be of most interest to Octavia Estate buyers. Both are remarkably efficient, with the 1.6 TDI emitting 99g/km of CO2, while the more powerful 2.0 TDI pumps out just 110g/km. The 1.6 is likely to be the bigger seller. It's up to the job of hauling around a car this big; with a reasonable amount of torque and a fairly progressive power delivery. However, this engine is available only with a five-speed gearbox, so there's a fairly big gap between some of the ratios. The 2.0 TDI gets a six-speed manual, and although it's slightly noisier than the 1.6, it has so much low-down muscle that you don't need to work it as hard. We also tried the turbocharged 1.4-litre petrol model, which forces you to change gear a little more often, but ultimately feels just as quick. Skoda hasn't raised the ride height for the four-wheel-drive models, but they come with a more sophisticated rear suspension set-up than other Octavia Estates, and offer a composed ride. That said, even the standard front-wheel-drive cars soak up most bumps with ease. Whichever model you choose, the Skoda isn't quite as agile as a Ford Mondeo, but its body stays pretty upright and composed through tight twists and turns, and there's plenty of grip. SE-spec cars and above have three drive modes: Normal, Sport and Eco. Throttle response and steering weight are changed, but the suspension is not affected. The throttle does sharpen nicely when Sport is selected, while the steering feels accurate and weights up consistently in each setting. At motorway speeds, some wind noise creeps into the cabin, but it's far from being intrusive, and there's little in the way of road noise. You get a huge amount of space in the Octavia Estate for a very competitive price, while its efficient engines mean that it will be affordable to run as either a private or company car. In effect, you're getting a car that's bigger than a VW Passat Estate for 2000 less. It's not the most dynamic estate available, but it is a practical and sensible choice.